Did you know you can check out more than books from the library? You can also check out a whole dang telescope, and gaze at the stars to your heart’s content. If that isn’t cool, well, what is? The library’s Orion Skyquest XT6 Dobsonian telescope was kindly donated by the Baton Rouge Astronomical Society, and it can be checked out by adults for one week at a time. All you have to do is attend a brief training class – there’s one tomorrow night! – and you can be searching the skies almost before you know it. 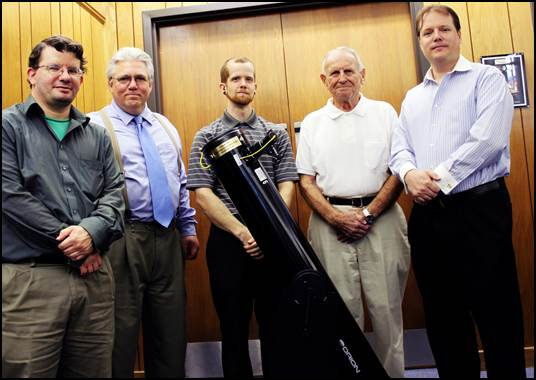 For more information about our telescope, please call the Circulation Department at (225) 231-3740. To learn more about space, or about astronomy research done in Baton Rouge, contact the Baton Rouge Astronomical Society and the Highland Road Park Observatory. An image from Space.com of the Milky Way’s center and bulge over the ESO 3.6-metre telescope.